Hope you had a great start in the week. I am about to be finished with exams, next week, can't wait for it. Our problem with the water is going on but I will be leaving home for a training from Wednesday to Friday so hubby has to deal with it. C'est la vie. This must be the first time I can't wait to take a nice shower in the hotel I will be staying haha. First impressions, this is a very interesting design. I though it is almost like toy make-up but I could see that it will be a big success when I shared the first photos at Instagram. We girls love cute things after all and these bottles, which look like mini perfume bottles, are so adorable. Looking at the new skin care series which will be launched in a few months for youngsters as well as the new fonts on the packaging with this launch, it is easier to see that Guerlain decided to aim for younger customers. Should start with the bad news first? The current nail polishes, Guerlain La Lacquer, will all be discontinued so if you were eyeing something, you should go and grab it before they are gone for good. This also applies to Rouge Automatique. I loved the packaging of Rouge Automatique so I have to admit I am a little disappointed to see them go. I am still testing the new lipsticks, so bare with me with the review. The lipsticks and nail polishes are both scented and lipsticks also taste good. With this new release Guerlain wants to reach to all our senses. I am impartial to scent and taste in lipsticks but after getting used to my nails smelling of La Petite Robe Noire, I have to say that I am hooked. Now let's compare the new line to the older ones. I have three generations of Guerlain Nail Polish in my stash. The right most one is from legendary Liu Collection which was released during 2012 Holidays. You can see that Guerlain found out early that round bottles are not preferred (I wish Armani would see this too), so right after that release, they changed the bottles and the formula. The name was Nail Lacquer for Hands and Feet, hilarious right? Who would think you can apply it to your feet too! Those had tiny brushes, non removable cap but a generous amount of 11.5 ml nail polish in there. In 2013 Guerlain released La Laque Couleur with edges (yay!) and flat brush (yay square!). The cap was removable and the bottle, although appeared huge, had only 10 ml of nail polish, a little less than the previous version. I have (almost) all the shades of this release because I liked the formula and the brush. Recently the limited edition shades such as Blue Ocean (reviewed here) ticked all the right boxes for me. 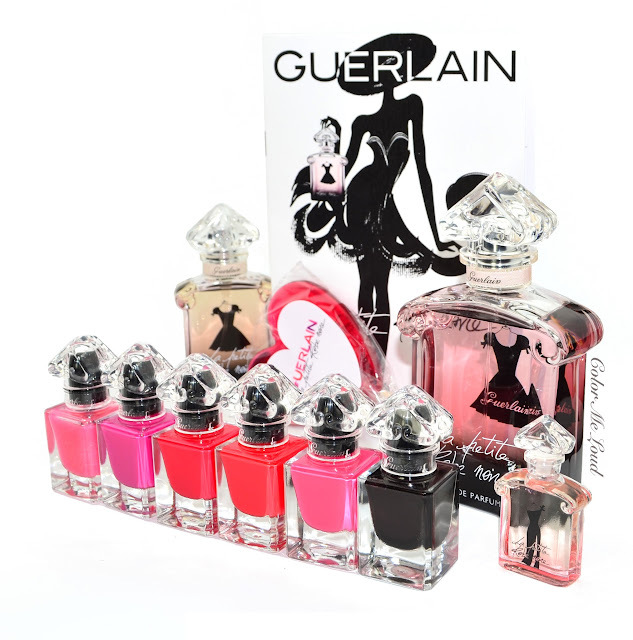 Three years later, Guerlain now revises their nail polishes. The new bottle is cute as a button, the cap can be removed, the brush is flat but sprays more than the older one. I find this brush to be close to Dior's, another one which I also like. I personally find Chanel's a little too tiny for my taste. One more thing to mention is that the new bottles have only 8.5 ml of nail polish, which is a pity. I have over 500 bottles at home so it is not like that I will ever finish one bottle in my life (except top coats) but still the down trend is not that good. I somehow liked the last design too, which one do you prefer? Let me show you the shades and we go on from there. Here is #001 My First Nail Polish, which is thought to be for younger people who just start wearing nail polish. It is a sheer pink base with some tiny glitters. You can see me wearing two coats below. The good thing about this is that it doesn't show how yellow the nails are haha. That said, I am not into sheer nail polish but I loved this one as a subtle top coat on the other pinks of the collection, which I am wearing at the moment on my tips. Here is one of my favs, Guerlain La Petite Robe Noire #002 Pink Tie is a hot pink/magenda with cream finish. It applies beautifully, it is opaque with two coats. These also last well. I tested two shades and had a 5-6 days with minor tip wear. The brush and the formula doesn't leave any of my wishes open. The scent? I have to mention some are more scented than the others. I found out that #001 My First Nail Polish has the strongest scent and #007 Black Perfecto has the subtlest scent. Here is another more natural/warmer pink with cream finish called #063 Pink Button. This shade reminded me directly of some newly released Dior nail polishes and I was right (check out the comparisons below). Again very nice formula, two coats for opacity. No issues of any kind with application. 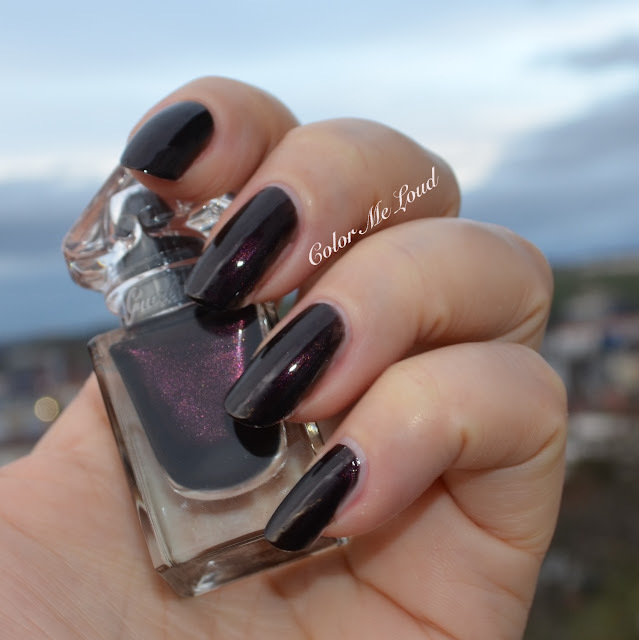 Another favorite of mine, Guerlain La Petite Robe Noire #007 Black Perfecto is a gorgeous blackened plum with hidden shimmer. Once the light touches the surface of the nails, it looks stunning. I tried to capture that below with flash. I was in Breuninger Stuttgart on Saturday to purchase the shades I was missing and this shade was already sold out! Dear Guerlain, see it as a sign, we want more original colors of these, not only pinks and reds! Oh and there is a matching lipstick to this one which looks so black in the tube but it is very sheer once applied, more about that soon. Here are some similar shades to consider if you are splurging. 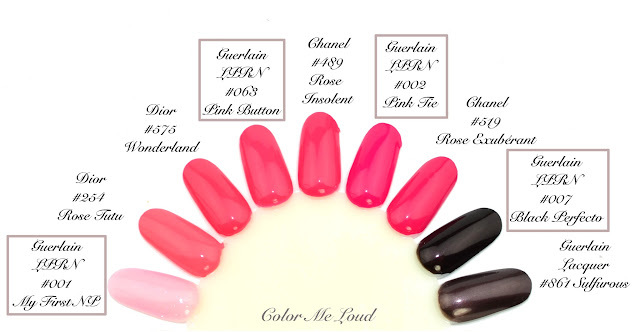 Guerlain #063 Pink Button is very close to Dior #575 Wonderland and just a tad deeper than Dior #254 Rose Tutu. 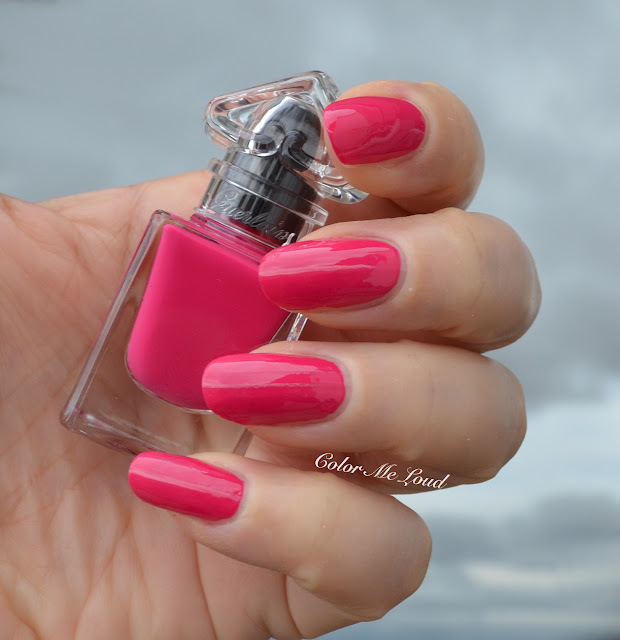 Chanel #489 Rose Insolent is more pink and deeper than Pink Button. Guerlain #002 Pink Tie is slightly cooler than Chanel #519 Rose Exubérant. Guerlain #007 Black Perfection reminded me of Guerlain #861 Sulfurous but it is less metallic and more blackened once compared. 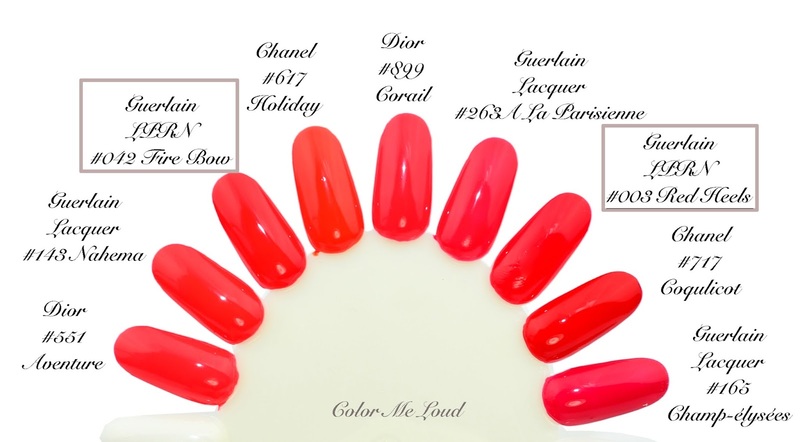 There are also two reds, Guerlain La Petite Robe Noire #042 Fire Bow is an orange/red with cream finish. The reds have even better formula, one coat might even be enough but I usually go for two nonetheless. Fire Bow is a polish I would wear if I need a bit of cheering up. I can see rocking this with a tan in summer, can't wait. La Petite Robe Noire #003 Red Heels is surprising as being "the red" of the collection. One would expect something more saturated and deeper but instead Red Heels is a very cheerful poppy red. This one probably has the best formula and can be a one coater but I applied two. I don't like very classical red nails but this one is so gorgeous, it is a mood lifter. Again, more suited to summer than winter I think. 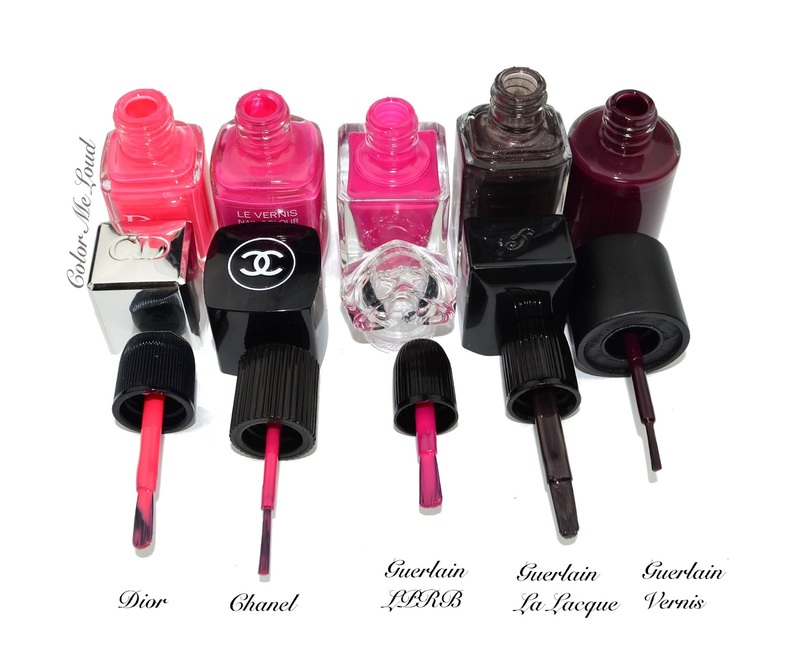 Here are some comparisons of the new and old reds as well as some closer shades from Chanel and Dior. Guerlain #042 Fire Bow is very close to Dior #551 Aventure (which is slightly cooler) and Guerlain #443 Nahema (which is slightly warmer). Chanel #617 Holiday is warmer than all the other shades in the wheel. 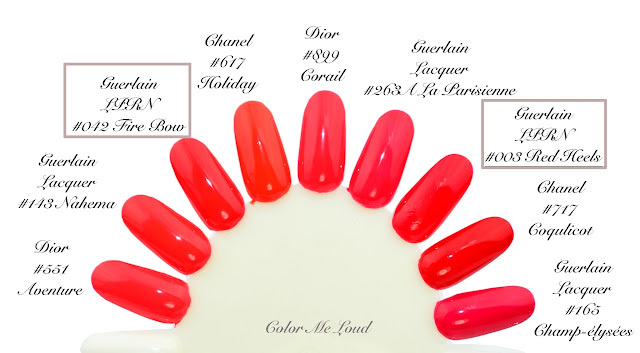 Dior #899 Corail is also close to Fire Bow. Guerlain #263 A La Parisienne is cooler than Guerlain #042 Fire Bow. 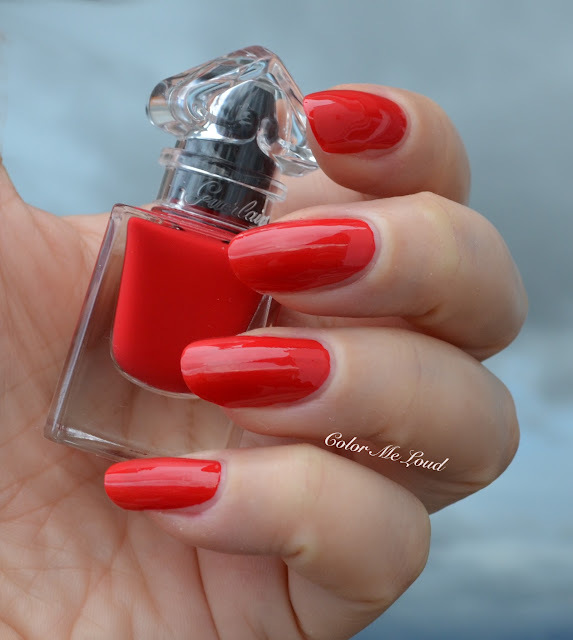 Guerlain #003 Red Heels is oh so vibrant, love love it. It is even brighter than Chanel's Coquelicot (reviewed here sorry for the typo in the wheel). Coquelicot is one of my most bright reds so I was surprised to see it is possible to go even brighter without getting neon. Guerlain #163 Champs-Élysées is cooler than Red Heels. Final thoughts: New packaging is very adorable and the formula of all the shades I have tried are great. I wished some of the asian exclusive shades with deeper reds and apricot would also be released here. The new bottles are a little smaller in size which is booh but the new brush is even better than the older one. Get ready to have fragrance on your tips too because these smell like La Petite Robe Noire. Guerlain La Petite Robe Noire Nail Polishes and Lipsticks are now available in stores and online in Germany. I don't have information about when they will arrive the States. How do you find the packaging? Does any of the shades catch your eye? Disclaimer: Pink Button and Fire Bow were purchased by me. Others shades given free of charge for my consideration. Wow! First of all, thank you for taking on this huge task--all that swatching and photographing and writing takes forever, so thankyouthankyouthankyou! As for the Guerlain nail polish--the bottles seem cute, but other than that purple, the shades don't seem particularly interesting. I'm glad you're pleased with the formula and the brush--I too find the Chanel brush annoyingly tiny--but If Guerlain really wants to get into the nail polish game, they'll need to release more varied colors. Also, will I seem completely middle-aged if I confess that I don't know what La Petite Robe Noir smells like? It is rather sweet, with black cherry as the leading note. I love the Chanel brush - I have small nail beds so the thinner the better for ease of application. But I am very displeased with Chanel's new design and, if LA Sunrise is anything to go by, the formulation too. So maybe I will have to switch my collecting to these cuties instead of Chanel in future! Thank you for all the swatches and comparison! I'm very excited for these cute lacquers to be released in the US, but I have to say that the shades in the line so far are not very exciting. Nothing truly unique or original, I can see why Black Perfecto would sell out so fast since it's the only shade that's not extremely classic (I have a very old Dior polish called Réglisse that I think could be similar to Black Perfecto, maybe with larger shimmer). Let's hope that they'll release more shades in the future! Thanks for the comparison swatches. I have a few Diors that I think are very close to the pinks. Definitely want to try Black Perfecto if and when it's released in the US. It is a stunning color. I was thinking the same thing and was wondering why Guerlain didn't come up with a few more unusual shades to include in this launch. There's nothing wrong with classics, but since this is a new collection, it could have been a bit more imaginative; a bit more exciting. Perhaps they limited the colors because they were going for matching lips and nails with this first release. So many of Guerlain's classic fragrances were created decades ago and are evocative of another time. They are more deliberate in the notes they hit and they make a strong statement about the woman wearing the scent. Someone probably decided Guerlain needed a modern fragrance that would appeal to younger women; something fun, frothy, and utterly charming; something that says good times :-) They succeeded brilliantly with La Petite Robe Noire. It's a youthful take on Guerlain fragrances which means it has a level of sophistication not typically found in perfumes marketed to teens and twenty-somethings. That's not to say this fragrance is only suited to young women. It can be worn by anyone who can still appreciate the allure and simplicity of "a little black dress". now get me ideas how this cutesy could qualify as "essential"? Oh WOW Black Perfecto I needo! Those bottles are cute as a button, but the brush looks kinda dinky in the picture? You said they're like Dior? Hmm.... And scented nail polish sounds like fun!!! Time to bring my LPRN out again! Just stumbled onto this and super disappointed they are changing the polish bottles. I just got into Guerlain and have the LE colors and love them. Not into scented polish as it gives me a headache by the end of the day. With Chanel changing and now Guerlain I'm super broke getting old colors! They are discontinuing Rouge Automatique? Disappointed. These are very pretty but I have many colors in this range and don't like additional perfume. do you know if it is limited addition? or not? Gosh, it seems that Guerlain are taking profit maximisation tips from the Cream Egg manufacturers. These are very cute, maybe they're just too girly for me, but I prefer Revlon's rendition of perfumed nail varnish - their little perfume style bottles look super chic. The polish looks and smells good too!